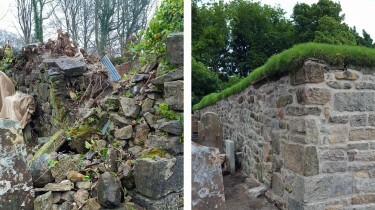 Works to save St. Bride’s Chapel in Arran from falling into ruin are complete. This Scheduled Ancient Monument was constructed during a fascinating period in history and is the only pre Reformation church on the island. Just six months ago, extensive vegetation had taken over, and large sections of the 14th century structure were collapsing. Following a scheme of extensive repairs and consolidation the structure has been rescued for the benefit of future generations. Congratulations to you and the project team for a great job on behalf of North Ayrshire Council. We have already had positive feedback from the community.